Alex Morgan converted a penalty kick and Kristen Edmonds scored her first goal of the season as the Orlando Pride beat Utah Royals FC 2-1 on the road at Rio Tinto Stadium in Sandy, Utah. The win moves the Pride to 8-6-4 (28 points) on the season and they remain in third place. It’s a bounce back win after a 3-1 loss in Houston on Wednesday night that also saw Marta get red carded in the dying moments and have to sit out Saturday’s game in Utah. Utah Royals FC are now 5-6-6 with 21 points, and the loss is their third straight. They’re in sixth place and have a game in hand, but sit seven points behind the Red Stars and Pride who are tied on 28 points. Edmonds scored the game-winner in the 52nd minute, chipping Utah Royals FC goalkeeper Abby Smith after an assist from defender Ali Krieger. The assist for Krieger came in her 100th NWSL appearance. 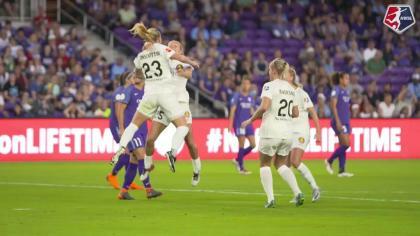 Utah Royals FC forward Amy Rodriguez opened the scoring in the eighth minute, volleying a cross from Rachel Corsie past Pride goalkeeper Ashlyn Harris. The Pride leveled the match at the end of the first half on a penalty kick. On a Pride corner kick, Gunnhildur Jónsdóttir was whistled for holding Alanna Kennedy in the box and Orlando was awarded a penalty kick. Morgan scored from the spot to make it 1-1. It’s the fourth goal of the season for Morgan. Corsie came up with a big defensive play in the second half in the 65th minute after Smith was caught off her line. Pride forward Sydney Leroux — who subbed in for Morgan in the 62nd minute, took a shot at the open net, but Corsie got just enough of her head on it to push it wide. Match ends, Utah Royals 1, Orlando Pride 2. Second Half ends, Utah Royals 1, Orlando Pride 2. Attempt missed. Christen Press (Utah Royals) right footed shot from outside the box is close, but misses the top right corner. Assisted by Katrina-Lee Gorry. Sidney Miramontez (Utah Royals) wins a free kick in the defensive half. Attempt missed. Rachel Corsie (Utah Royals) header from the centre of the box misses to the left. Assisted by Katrina-Lee Gorry following a set piece situation. Substitution, Orlando Pride. Christine Nairn replaces Toni Pressley. Offside, Orlando Pride. Ashlyn Harris tries a through ball, but Rachel Hill is caught offside. Offside, Utah Royals. Katie Stengel tries a through ball, but Gunnhildur Yrsa Jonsdottir is caught offside. Offside, Utah Royals. Rebecca Moros tries a through ball, but Gunnhildur Yrsa Jonsdottir is caught offside. Offside, Orlando Pride. Dani Weatherholt tries a through ball, but Rachel Hill is caught offside. Attempt saved. Rachel Hill (Orlando Pride) header from the centre of the box is saved in the centre of the goal. Assisted by Camila with a cross. Substitution, Utah Royals. Katrina-Lee Gorry replaces Diana Matheson. Corner, Orlando Pride. Conceded by Sidney Miramontez. Attempt missed. Toni Pressley (Orlando Pride) left footed shot from more than 35 yards is high and wide to the left. Assisted by Chioma Ubogagu. Attempt blocked. Chioma Ubogagu (Orlando Pride) left footed shot from outside the box is blocked. Assisted by Shelina Zadorsky with a headed pass. Katie Bowen (Utah Royals) wins a free kick on the right wing. Attempt saved. Sydney Leroux (Orlando Pride) right footed shot from a difficult angle on the left is saved in the centre of the goal. Assisted by Chioma Ubogagu. Substitution, Utah Royals. Nicole Barnhart replaces Abby Smith because of an injury. Attempt missed. Alanna Kennedy (Orlando Pride) header from the centre of the box is just a bit too high. Assisted by Chioma Ubogagu with a cross following a corner. Corner, Orlando Pride. Conceded by Rachel Corsie. Attempt blocked. Sydney Leroux (Orlando Pride) right footed shot from outside the box is blocked. Substitution, Orlando Pride. Sydney Leroux replaces Alex Morgan. Offside, Orlando Pride. Alanna Kennedy tries a through ball, but Alex Morgan is caught offside. Attempt missed. Christen Press (Utah Royals) left footed shot from outside the box is high and wide to the left. Assisted by Diana Matheson. Attempt blocked. Amy Rodriguez (Utah Royals) right footed shot from the centre of the box is blocked. Goal! Utah Royals 1, Orlando Pride 2. Kristen Edmonds (Orlando Pride) right footed shot from long range on the right to the high centre of the goal. Assisted by Ali Krieger. Amy Rodriguez (Utah Royals) wins a free kick in the attacking half. Attempt missed. Amy Rodriguez (Utah Royals) left footed shot from the left side of the box is too high. Second Half begins Utah Royals 1, Orlando Pride 1. First Half ends, Utah Royals 1, Orlando Pride 1. Gunnhildur Yrsa Jonsdottir (Utah Royals). Goal! Utah Royals 1, Orlando Pride 1. Alex Morgan (Orlando Pride) converts the penalty with a left footed shot to the top right corner. Penalty conceded by Gunnhildur Yrsa Jonsdottir (Utah Royals) after a foul in the penalty area. Penalty Orlando Pride. Alanna Kennedy draws a foul in the penalty area. Attempt saved. Katie Bowen (Utah Royals) right footed shot from outside the box is saved in the top centre of the goal. Offside, Utah Royals. Desiree Scott tries a through ball, but Amy Rodriguez is caught offside. Attempt missed. Chioma Ubogagu (Orlando Pride) header from the centre of the box misses to the left. Assisted by Ali Krieger following a set piece situation. Offside, Utah Royals. Amy Rodriguez tries a through ball, but Christen Press is caught offside. Attempt missed. Alanna Kennedy (Orlando Pride) header from the centre of the box is too high. Assisted by Ali Krieger with a cross following a corner. Corner, Orlando Pride. Conceded by Katie Bowen. Attempt missed. Alex Morgan (Orlando Pride) right footed shot from the left side of the box is high and wide to the right. Assisted by Rachel Hill. Rachel Hill (Orlando Pride) is shown the yellow card for a bad foul. Attempt saved. Alex Morgan (Orlando Pride) left footed shot from the left side of the box is saved in the centre of the goal. Assisted by Dani Weatherholt. Attempt missed. Rachel Hill (Orlando Pride) left footed shot from the left side of the box is close, but misses the top left corner. Assisted by Alanna Kennedy following a fast break. Offside, Orlando Pride. Dani Weatherholt tries a through ball, but Alex Morgan is caught offside. Goal! Utah Royals 1, Orlando Pride 0. Amy Rodriguez (Utah Royals) left footed shot from the centre of the box to the top right corner. Assisted by Rachel Corsie. Corner, Utah Royals. Conceded by Mônica. Attempt saved. 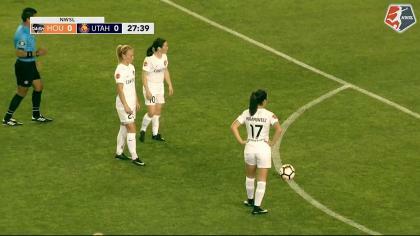 Amy Rodriguez (Utah Royals) left footed shot from the centre of the box is saved in the centre of the goal. Assisted by Diana Matheson. Offside, Utah Royals. Abby Smith tries a through ball, but Diana Matheson is caught offside.